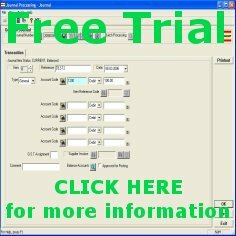 If you change the user who is logging in to a particular PC, or if you are running Terminal Services so that effectively all your users are connecting to a single PC, then it is not necessary to re-run the Workstation Installation for every user, as this involves recopying all the Crystal Reports DLLs as well as creating the ODBC entries. 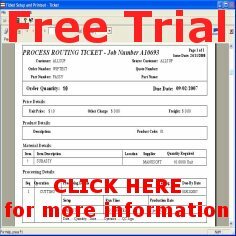 Instead you can manually create the ODBC entries and just get on with things. The first thing to be aware of is the complications that can arise on 64-Bit Windows. 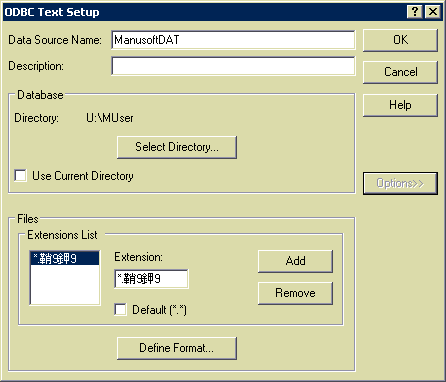 ManuSoft is a 32-Bit program and as such “talks” to 32-Bit ODBC drivers. On 64-Bit Windows XP, Vista and Windows 7, if you go into “Control Panel” -> “Administrative Tools” -> “Data Sources (ODBC)” then you end up opening the 64-Bit ODBC applet, and things don’t work quite right. In this case, manually run the 32-Bit ODBC Applet by going in to “Start” then “Run”, then entering “%windir%\SysWOW64\odbcad32.exe” as the program you wish to run. 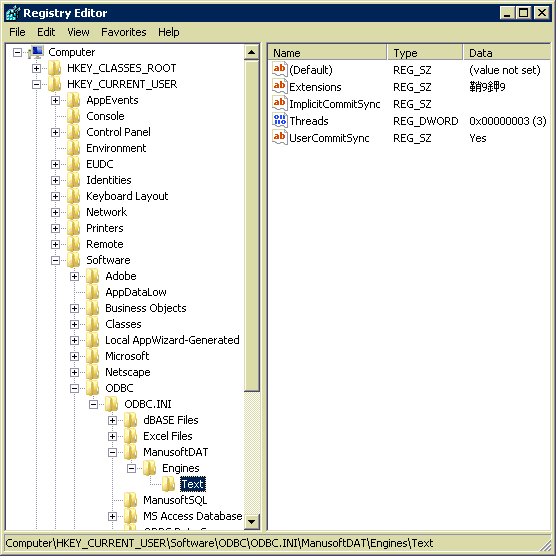 Starting with Windows 8, Microsoft has stopped hiding the 32-bit ODBC applet in the Control Panel, so you just need to make sure you start the correct one. 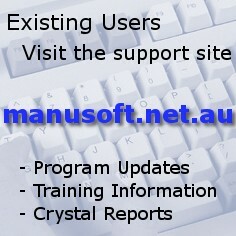 Select Directory: Browse to your “Crystal Reporting Drive” as defined in your ManuSoft System Installation program. It is typically something like “C:\User”, or “H:\User”. Click “OK” to save your changes and close the window. Click “Add..” again and select “SQL Server” from the list and click “Finish”. 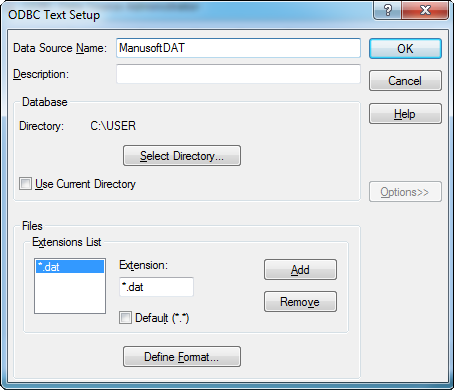 A “Create New Data Source to SQL Server” wizard-style dialog will open. Sever: The name of your SQL Server running ManuSoft, something like “SERVER\SQLExpress” or “SERVER\MANUSOFT”. You can click the drop-down arrow to get, after a pause, a list of SQL Servers on your network, but it is not guaranteed that your ManuSoft SQL server will appear in this list, depending on your configuration. Click “Next >” to move to the next screen. Click “Next >” to move to the next screen. There may be a pause as the connection is made. If you get an error at this point use the back button to check the name of the SQL Server you entered on the first page, or get in touch with ManuSoft support. Leave all other settings on this screen on their defaults. On the fourth and last screen leave all the settings on their defaults and click “Finish”. A final confirmation dialog opens. You can click “Test Data Source…” just to confirm everything is working, then click “OK” to close everything and return to the “ODBC Data Source Administrator”. Click “OK” to close the “ODBC Data Source Administrator”. That’s it! Start ManuSoft and test a few reports to make sure things are working; printing a Job Ticket is a good test of both the ManusoftDAT and ManusoftSQL data sources. Click “Start” -> “Run” and enter “regedit” and click OK.
You may get a “security prompt” of some sort before the program starts. Accept the warnings and enter your password if required. Note the Chinese/Japanese characters are next to the “Extensions” value on the right hand side. Double click on the “Extensions” entry to open an “Edit String” dialog box. Delete the bad characters in the “Value data” text box and enter “dat” instead. Hopefully that will fix the error for good, unless you go into the “ODBC Text Setup” dialog in Control Panel, but it should be necessary for you to ever go back there anyway. This entry was posted in Uncategorized on February 10, 2014 by wpadmin.